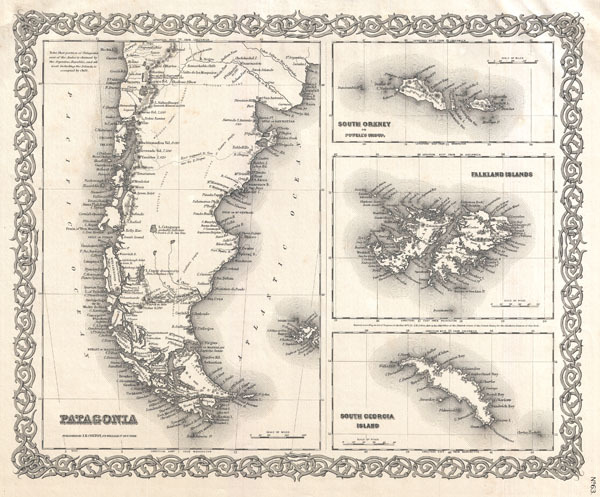 1855 Colton Map of Patagonia and the Falkland Islands. Shows early state of exploration. Patagonia. South Georgia Island. South Orkney or Powell's Group. Falkland Islands. An excellent first edition example of Colton's rare 1855 Patagonia, the Falkland Islands, South Georgia Islands, and the Powell Group. Divided into four maps. Left hand map covers Patagonia, which, when this map was made, remained largely unexplored. Shows speculative river courses, recently discovered lakes, and offers notations on various explorers to the region. Upper right map details South Orkney or Powell's Group. These Antarctic islands are rarely visited and were discovered by British seal hunters in 1821. The right center map details the Falkland Islands - currently a British dependency. The lower right map details South Georgia Islands - one of the most remote and southernmost islands on Earth. Throughout the map Colton identifies various cities, towns, forts, rivers, rapids, fords, and an assortment of additional topographical details. Surrounded by Colton's typical spiral motif border. Dated and copyrighted to J. H. Colton, 1855. Published as page no. 63 in volume 1 of the first edition of George Washington Colton's 1855 Atlas of the World. Rumsey 0149.116 (1856 edition). Phillips (Atlases) 816.